Last week, I had the pleasure of joining @Marcelodiazb from IncubaUC and @HiroshiWald of Austral Capital again for Geek Camp IV. I last mentored a set of geeks in Geek Camp 3, primarily listening to their business pitch and providing feedback. This time, I decided to try something different. I decided to hold "office hours" where I didn't want to be pitched by a PowerPoint deck. 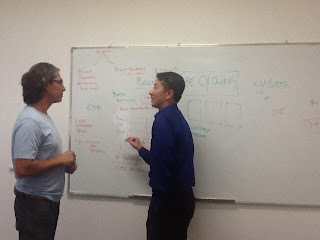 I had founders stand with me up at a white board (my favorite canvas, followed by PowerPoint) and describe their business model and to share a challenge or decision they were facing. 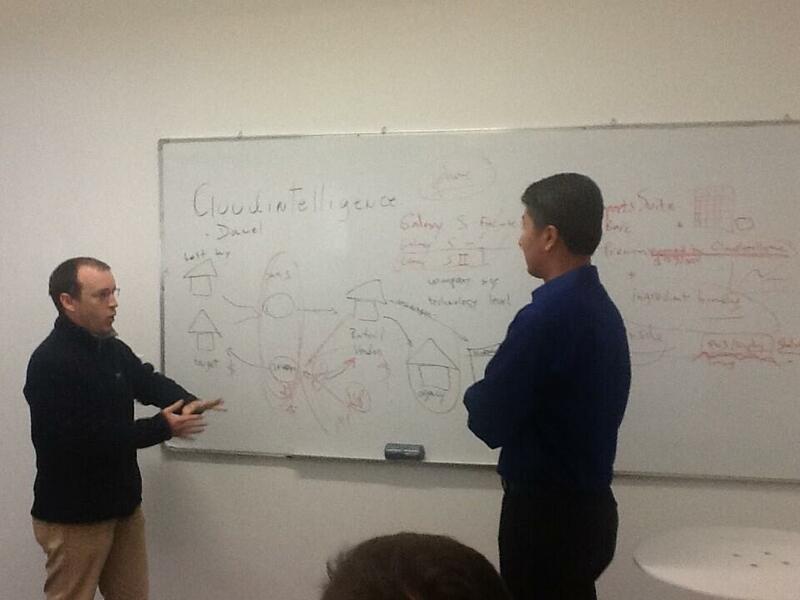 The first guinea pig was Daniel from Cloud Intelligence, which developed a business intelligence reporting software for retail and manufacturing industry. We had a great discussion about where he could best create and extract value from the industry: retailers, distributors, or manufacturers. This in turn led us to develop the GTM strategy once we figured out where to fit in within the value chain. I also met with Javier from BeCycling. His company had developed a bicycling app that let people complete challenges to receive rewards for their community. For example, if I completed a bike race, it might go towards a new bike rack at the local library. What was interesting is he had some altruistic and socially responsible ambitions. He wanted to focus on corporations' employee wellness programs and non-profits who would want to sponsor and promote biking challenges to improve the world. But then I had him imagine what if we targeted advertisers instead. For one, marketers spend a lot more money than corporate and non-profit do-gooders. So, we talked about various ad products that could be integrated into the app for brand advertisers or direct marketers. For example, creating a CPL-based lead gen form for a bicycle insurance company he was starting to talk to. A few more entrepreneurs went to the front of the class, and by the end of the day, I had a blast! I was fired up to see all these young entrepreneurs with such passion and drive, making me feel more alive as well. So, thank you, Geeks! In the end, I realized what I was to these young entrepreneurs. I wasn't a marketing guy or digital strategist. I was their THOUGHT BUDDY, someone to bounce ideas off of and build on each other's comments in conversation.